Usually ships within one business day after receipt of order. * Do you want holes in the sidewalls? Do you need a sump pump (optional)? Recommended and used by engineers and industry professionals. 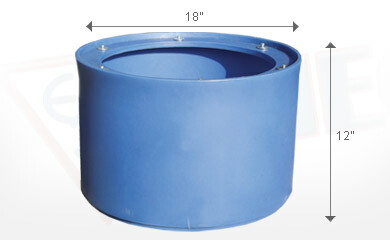 The Saber sump pit is rotational molded from high quality, impact resistant polyethylene. Significantly out performs typical injection molded polyethylene structural foam sump basins that are rigid. The Saber sump pit will not fail under soil shifting or ground heaving conditions. 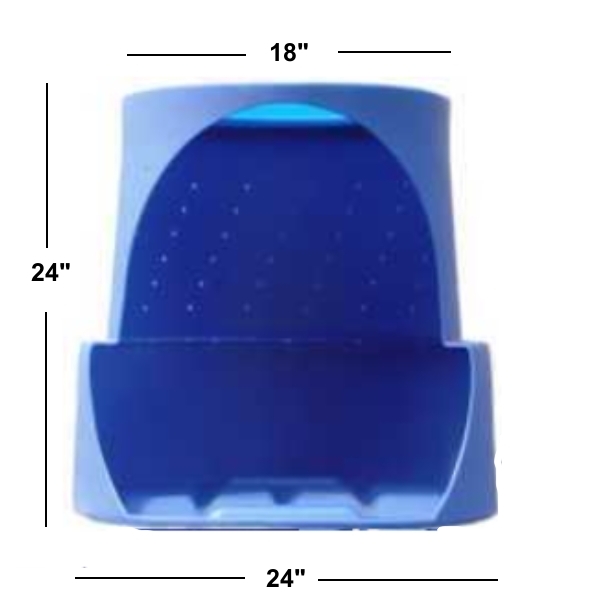 Can be used for indoor or outdoor applications. Set at any depth using the Saber sump pit 12" extensions. The sump basin reduces subsurface soil moisture content. Efficient, affordable and guaranteed for life. Accommodates up to 2 sump pumps for backup applications. 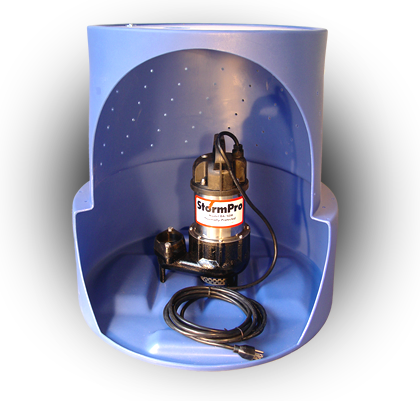 Works well with SumpDirect's StormPro series sump pumps. This engineered sump pit incorporates side wall tank perforations drilled at optimal placement and density to allow ground water to flow freely into the sump pit while minimizing sediment infiltration. 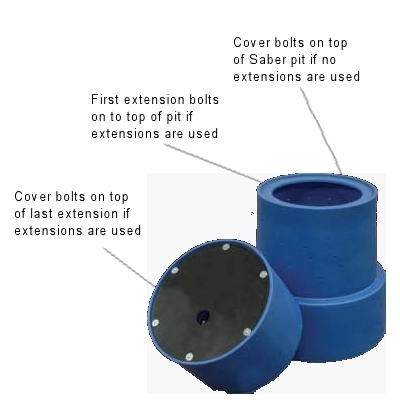 Can be used for sub-grade applications inside or outside at any depth (using Saber sump pit 12" extensions). Basement finishing part 3 - Saber sump basin installed. One of the best sump pits i have used in the last few years. I like the design and the shapes keeps it from popping up or shifting. Thick sidewall. Really nice professional look after installation. I bought the saber twin pump basin with lid. I received it in a timely fashion. I had an issue with the basin and had written a negative/neutral review (3 stars). I was just going to accept my purchase as a loss. Then Dave reached out to me after reading the review. He promptly rectfied everything to my complete satisfaction. Not once throughout the process was he difficult to me. I have since received a replacement basin from Sump Direct at no extra cost to me. I couldn't have asked for anything more. Received this sump pit today. Upon inspection, the walls are very thin... 1/8 -3/16 inch thick. Some areas appear to be even thinner than others when compressing the walls with my fingers. There are many spots that are easily pushed in with my fingers as compared to other areas at the same level along the curved walls. Not sure I would recommend this pit. The design idea is nice in regards to wider base to help prevent short cycling of pumps, but seriously needs to have much thicker walls. I haven't installed this yet, but I'm afraid I will see the walls of the basin bellowing in over time due to the weak/thin walled basin. I'm contemplating not using it and getting a basin that is much more rigid and sturdy, for this one definitely is not. Also, the pictured sump basin is clearly blue, the one I received was light grey/white. Not sure why this is...Did I actually receive a Saber Sump Pit???... Though the box said "saber sump pit" on it..
Color of pit can vary depending on manufacturing color batches. Customer was shipped a new pit at no charge. Click the button below to add the Saber Sump Pit to your wish list.